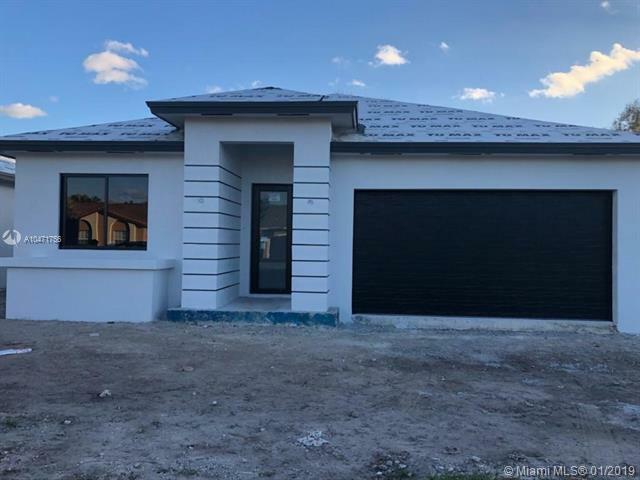 DON'T MISS OUT ON THIS BRAND NEW CONSTRUCTION HOME LOCATED IN WEST KENDALL. THIS 4 BED 3 BATH 2 CAR GARAGE SINGLE FAMILY HOME FEATURES, 24X24 PORCELAIN FLOORS THROUGHOUT THE ENTIRE HOME, HIGH IMPACT WINDOWS AND DOORS, 10FT CEILINGS, 8FTH DOORS, HUGE KITHEN AREA WITH GRANITE COUNTERTOPS AND ISLAND, LARGE GREAT ROOM, OVERSIZED LOT, NO HOA, NO CDD, AND NO BUILDERS FEE. SELLER WILL CREDIT BUYER $2500 FOR APPLIANCES, UPGRADES ARE AVAILABLE UPON REQUEST FOR ADDITIONAL COST. HURRY THESE HOMES WILL NOT LAST. ESTIMATED COMPLIATION DATE 11/30/2018 OR BEFORE.. CALL NOW THERE ARE 7 LOTS LEFT AND A SMALLER MODEL TO CHOOSE FROM.